Two A-7A Corsair II from Attack Squadron VA-153 Blue Tail Flies and an A-7B from VA-155 Silver Foxes dropping Mk.82 227 kg bombs over Vietnam. 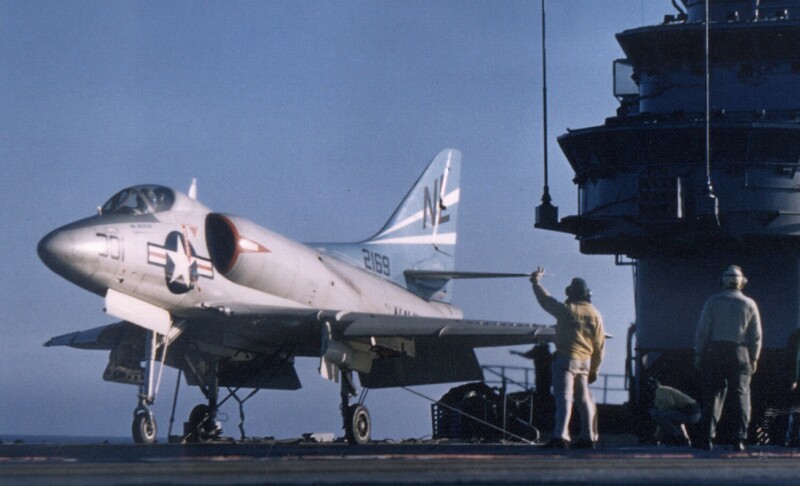 A-4B Skyhawk from Attack Squadron VA-153 Detachment R "Blue Tail Flies" in flight, armed with two AIM-9B Sidewinder missiles. During a reorganization of the Naval Air Reserve, a Fighter Squadron at NAS New York (believed to havebeen VF-718) was redesignated Fighter Squadron EIGHT HUNDRED THIRTY ONE (VF-831) in September 1949. 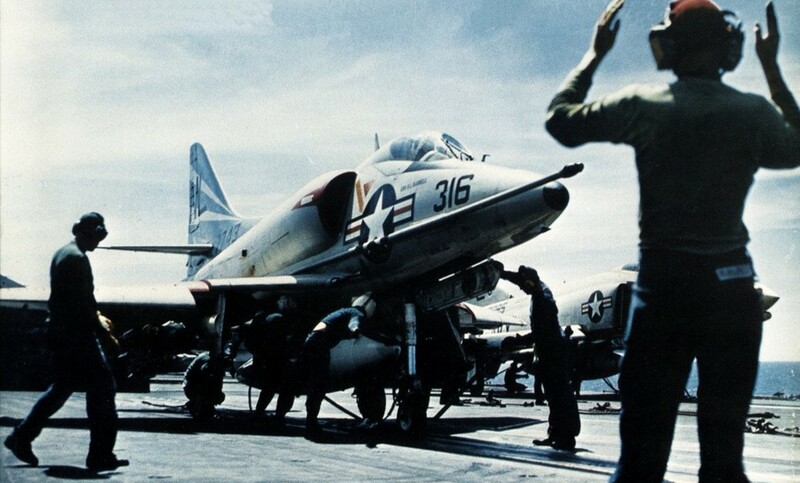 Reserve Fighter Squadron EIGHT HUNDRED THIRTY ONE (VF-831) was called to active duty on 1 February 1951. 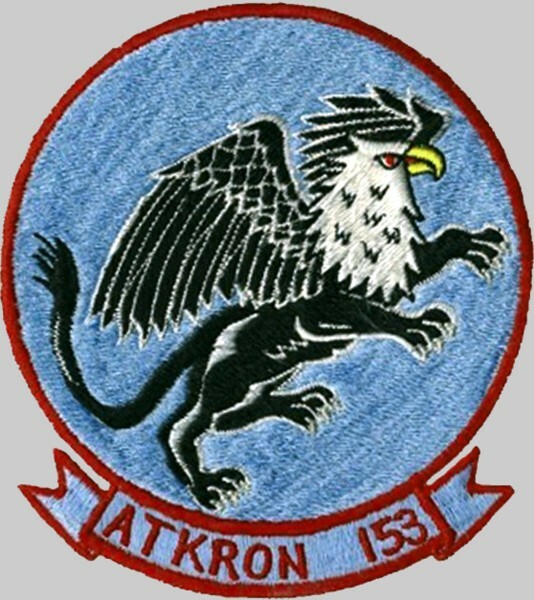 Redesignated Fighter Squadron ONE HUNDRED FIFTY THREE (VF-153) on 4 February 1953. 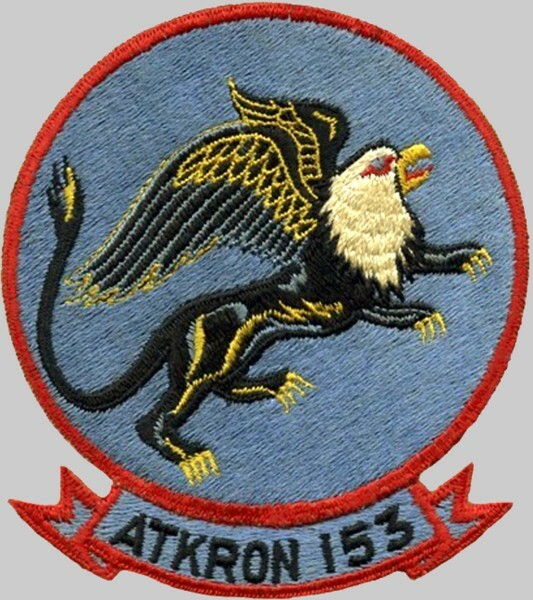 Redesignated Attack Squadron ONE HUNDRED FIFTY THREE (VA-153) on 15 December 1956. Disestablished on 30 September 1977. 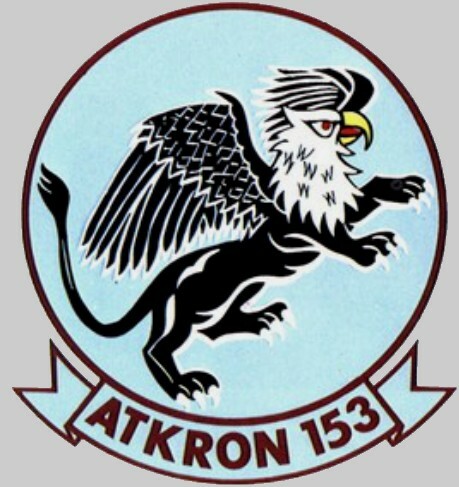 The first squadron to be assigned the VA-153 designation. 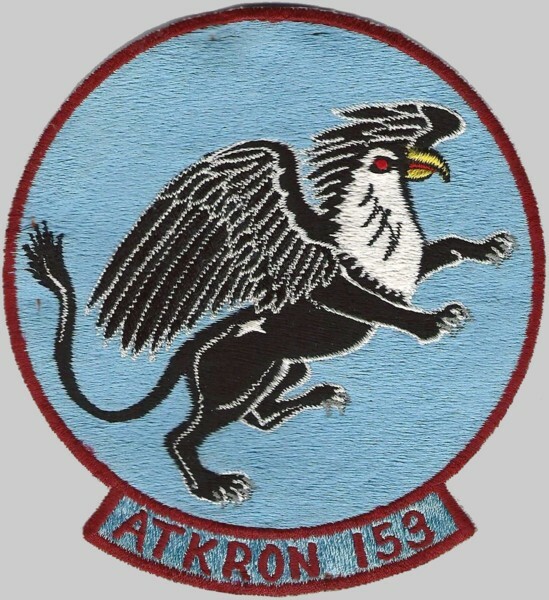 The squadron’s insignia was approved by CNO on 17 May1951. light blue background outlined in orange; the griffin’s body was black with white highlights, its beak and claws were orange and yellow, and the eagle head was white. Following the squadron’s two designation changes the basic insignia continued in use with minor modifications. The squadron flew sorties in the Taiwan Straits after the Chinese Communists bombarded Quemoy Island. 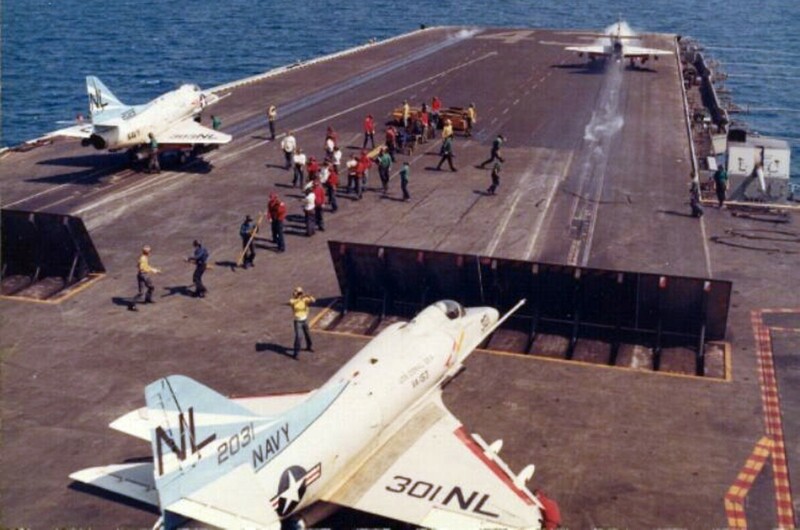 USS Coral Sea (CVA 43), with VA-153 embarked, operated in the South China Sea after Pathet Lao forces captured strategic positions in Laos. 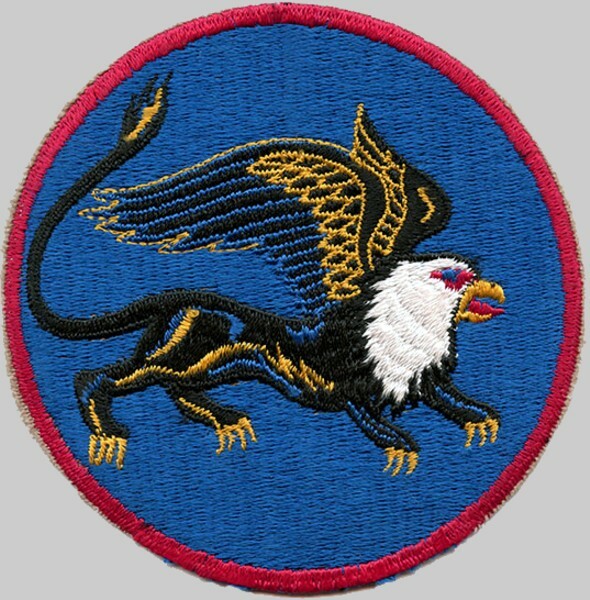 The squadron began participating in operations in Laos. 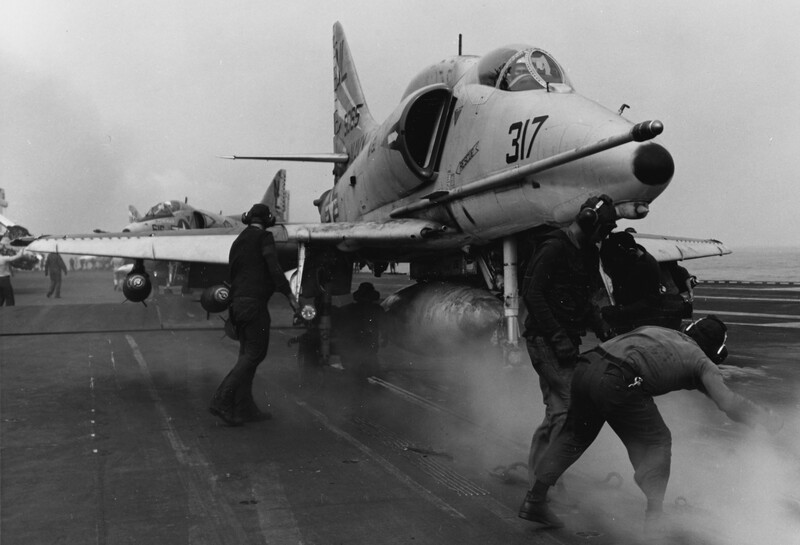 These operations involved Yankee Team, Barrel Roll and Steel Tiger missions. 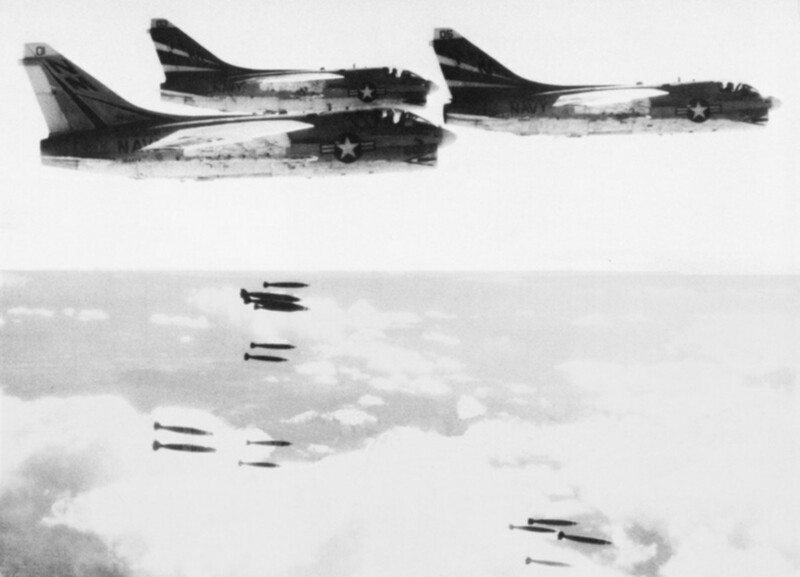 The squadron participated in Flaming Dart I and II, reprisal strikes against targets in North Vietnam following a Viet Cong attack on the American advisors compound at Pleiku and the American billet in Qui Nhon, South Vietnam. 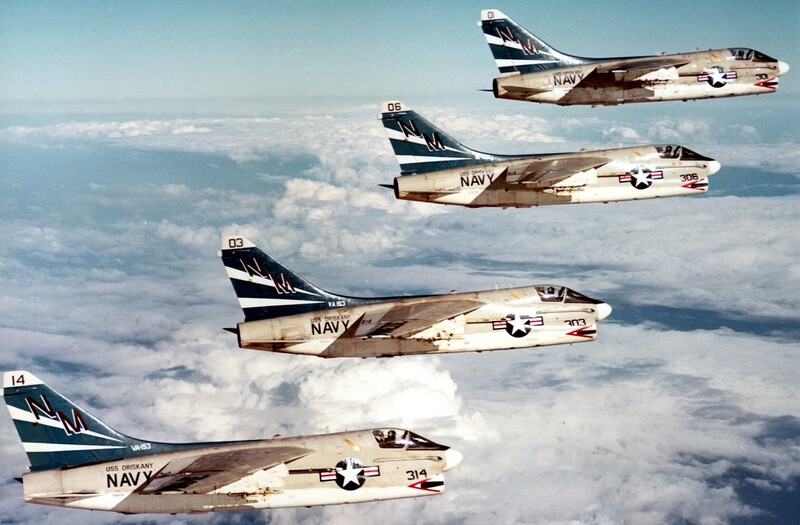 The squadron participated in Rolling Thunder operations, the bombing of military targets in North Vietnam. The squadron’s commanding officer, Commander H. E. Thomas, was killed in action over North Vietnam. 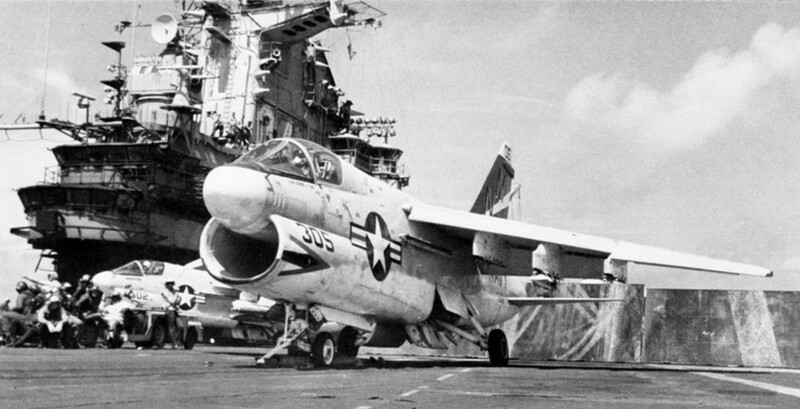 USS Coral Sea (CVA 43), with VA-153 embarked, operated on station off the coast of Korea following the capture of USS Pueblo (AGER 2) in January by North Korea. The squadron flew missions in support of an attempt to rescue American prisoners-of-war at the Son Tay prisoner compound, 20 miles west of Hanoi. Following the cease fire with North Vietnam the squadron flew combat missions in Laos until a cease fire was signed with that country on 22 February 1973. 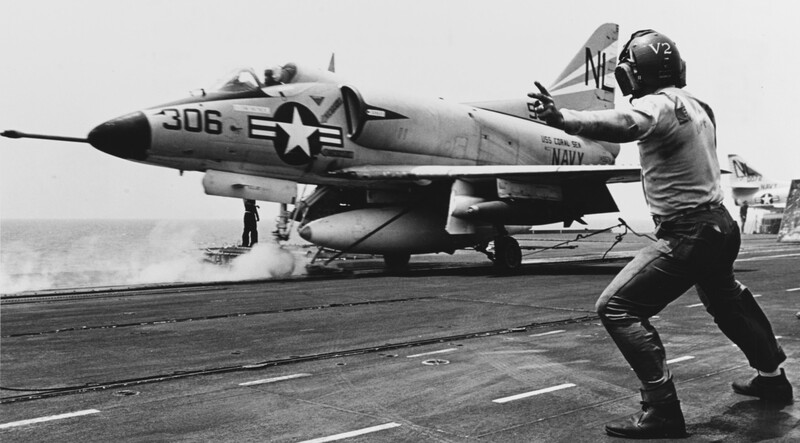 Commander D. R. Weichman, the squadron’s executive officer, completed his 625th combat mission of the Vietnam Conflict. He maintains the record for the highest number of combat missions for a Navy fixed-wing pilot during this conflict. 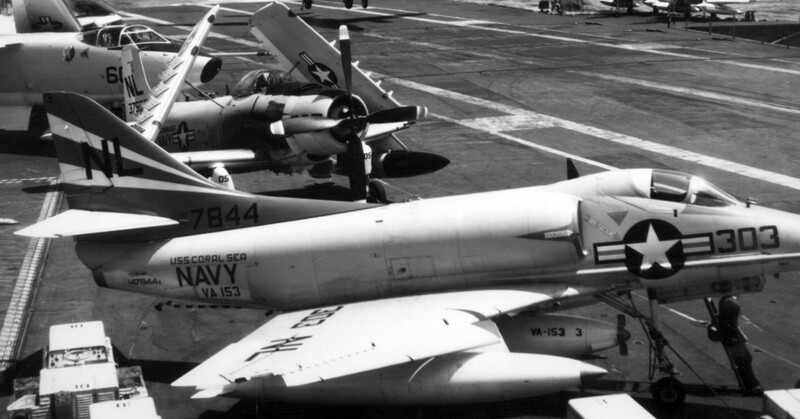 USS Oriskany (CVA 34), with VA-153 embarked, departed from operations in the South China Sea to relieve USS Hancock (CVA 19) on station in the Arabian Sea due to the unsettled conditions following the Yom Kippur War in the Middle East.